In order to become the perfect teacher, you should..
✔ Smile all the time!! ✔ Never fight with a student!! ✔ Learn new things to the class creatively!! ✔ Have fun in class!! ✔ Make sure all children participate!! ✔ Explain Grammar carefully and simply!! ✔ Never laugh at a student that said something incorrect!! ✔ Play interesting games in class!! ✔ Don't make your students have too much homework!! ✔ Make sure everyone has understood everything!! ✔ Say "Congratulations" to a correct answer!! ✔ Do extra things in class instead of the exercises the book has!! I'm sure that you have heard about ''To Do'' lists. But, do you know what are they? So, you may know how to make one of them, right? A ''To Do'' list is a list where you write things you can or must do one day. 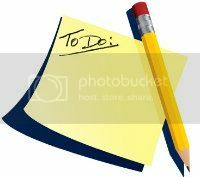 All ''To Do'' lists are very helpful, because they can help you not to forget what you have to do these days. Making a ''To Do'' list is very simple. 1.You just take a piece of paper and write on the top of it ''To Do : ''. 2.You write whatever you want or you have to do these days. 3.Now you can decorate your list. You can draw it with your markers(such as I do) or put some colorful stickers. So, wish this will help you. P.S. 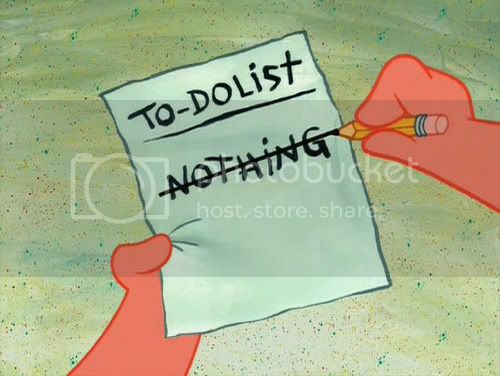 A ''To Do'' list is something creative to do when you're bored!! You must talk to a boy/girl that you want to fall in love with. You must talk with your friends and look at him at the same time to make him/her think that you talk about him/her. You must be only yourself and nobody else-that's why someone is going to fall in love with you, for your character. You must be friendly with everyone, especially him/her. You must have many things in common;the same favourite colour, etc. You must go for a (maybe romantic) walk with him/her soon. You must tolerate his/her annoying mum/dad/granpa/granma/sister/brother. If he/she tell you to be his/her girlfriend/boyfriend you must agree-you love him/her, right? You must be really funny and optimistic. You must be friendly and play with all children. You mustn't fight with someone in front of the children who watch you. You must use funny phrases to explain feelings, etc. You must have a big, red nose, which if you press it sounds like a car horn. You must wear silly and funny clothes and huge shoes with different colours. You must do some magic tricks. You must wear a small or huge hat with a little, lovely flower. You must do the most silly things of the world to make children laugh. You must have 1-10 warts (especially on the face) . You must learn how to laugh like all witches. You must wear a black dress and a huge, black hat. You must have a magic wand and learn how to use it. You must learn ALL the magic spells by heart. You must have another book full of recipes for magic potions. You must learn how to make a prince become a frog. You must learn how to fly with a magic mop.